National Service News: What Would You Do If the Unexpected Happened? What Would You Do If the Unexpected Happened? The current Atlantic hurricane season has been a harsh reminder of the devastation that can occur when major natural disasters strike. We keep our friends and neighbors in Texas, Florida, Puerto Rico, and other affected areas in our thoughts and prayers as our AmeriCorps and Senior Corps members are serving to help those communities through the long recovery process. But think about this ... what would you do if something unexpected happened in your community? Depending on your location, your hometown could be susceptible to floods, tornadoes, blizzards, earthquakes, blackouts, and other natural or man-made events that could disrupt normal routines. September is National Preparedness Month, and our partners at FEMA are leading the charge to encourage people to make plans for whenever the unexpected happens in your area with a multitude of resources at Ready.gov (and Listo.gov for Spanish speakers). There is a lot to think about, but here are some quick hints to help you prepare for an emergency or disaster in your community. 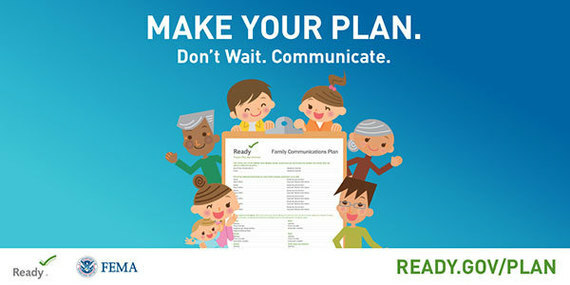 Have a plan: The time to make a family emergency plan is long before an emergency occurs. Make sure that the family has a designated gathering point where they meet in case of emergency and that everyone has access to a list of cell phone, work, or school numbers to contact other members away from home. Get some backup: It’s too late to think about backup plans when a power failure occurs, so make sure to keep a stock of flashlights with fresh batteries. Battery-powered chargers can come in handy for cell phones to keep the lines of communication open in an emergency. And if you have access to a backup generator, be sure it is serviced regularly so it will be ready to use when you need it. Where's the radio? : Have a battery-powered radio – again, with fresh batteries – to get news alerts in the event power goes out. Smartphone users can also download radio apps to keep abreast of local news. Ready.gov has a great list of resources with hints on how you can use your tech to stay informed during an emergency. Don't be thirsty: You will need a gallon of water per person per day when access to clean water is limited. Try to have a three-day supply stored and available. Stock up now: Avoid battling crowds at the local grocery store during a last-minute quest for milk and toilet paper. Some people keep specially stocked "go bags" that they can grab quickly in case of an emergency. Ready.gov has a list of items (also on Listo.gov) you will need to make your own disaster supplies kit that will keep you set for a few days. It's almost like we can hear our grandmother's advice echoing in our ears: "Stay ready, so you don't have to get ready." More than 1,800 AmeriCorps members and Senior Corps volunteers have responded to Hurricanes Harvey, Irma, and Maria recovery efforts. 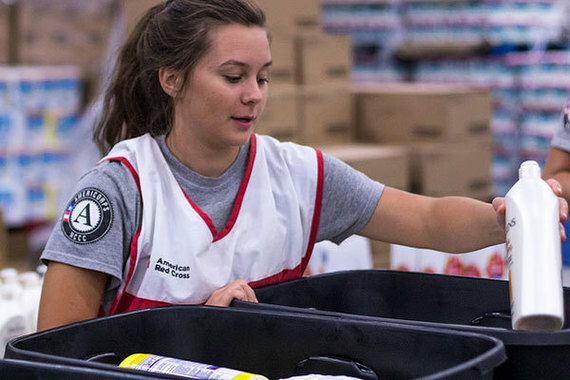 The photo above shows an AmeriCorps NCCC member serving with the American Red Cross as she sorts supplies for Hurricane Harvey survivors in Texas. You can learn more about the CNCS response to these disasters in our newsroom and on our 2017 disaster response page. A program placing local senior citizens in schools to serve as role models and tutors is receiving some national attention. The National Director of the Senior Corps program visited La Crosse Thursday morning to learn about the experiences of the La Crosse 'Foster Grandparent' program. This is the first year the La Crosse program has been the recipient of the federal 'Foster Grandparent' grant, giving it the chance to expand to additional counties. 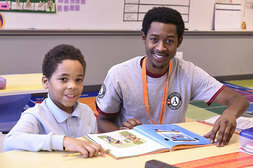 The program, led by Workforce Connections Incorporated, places adults 55 and older in local schools to work with disadvantaged children. For five years the nonprofit ‘Reading Partners’ has collaborated with low-income schools in Baltimore, pairing students who struggle to read with a community volunteer. This week those Reading Partners are back in schools, aiming to serve 900 students with the aid of 1,100 tutors. Today we’ll hear from executive director Jeffrey Zwillenberg about the project’s curriculum, and from returning volunteer Robin Kessler. Plus, Principal Najib Jammal of Lakeland Elementary Middle School describes how the benefits of one-on-one coaching extend beyond literacy. Share It: Senior Corps Tutors are Gr-r-eat!!! Each week, we will provide a social media shareable to use on your networks. 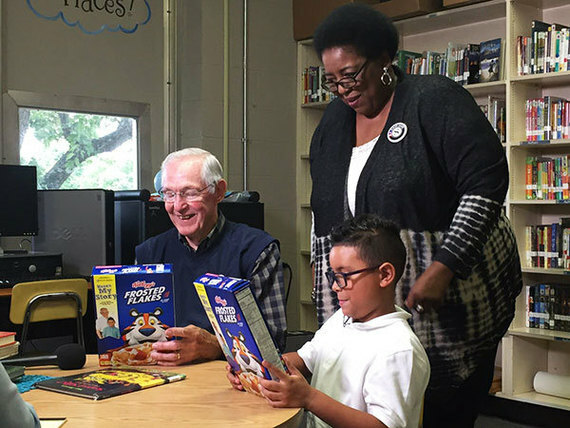 Today we want to highlight a story about how a Tennessee Senior Corps FiftyForward RSVP volunteer tutor and his student were featured on special Frosted Flakes cereal boxes for their work together. (We have no doubt that you will believe the story is gr-r-eat!) Follow the Facebook and Twitter links to watch the WKRN-TV feature and share it on your social networks. When she was growing up in Ahwatukee and attending Desert Vista High School, Mackenzie Bower could not have imagined herself helping hurricane victims. But that’s exactly what Bower, 25, has been doing lately, helping Houston victims of Hurricane Harvey who lost everything. She is working at a conference center converted into a gigantic shelter and going door-to-door in a flooded neighborhood to check up on victims. It’s all part of Bower’s 10-month stint in FEMA Corps, a government service program in which more than 1,000 young people fan out across the country and help people in need after natural disasters. Fifty per week. That's how many diaper changes the average infant or toddler needs over three years, according to a news release from the city. For people struggling to make ends meet, that can be a steep expense. The city said diapers cannot be bought with food stamps or Women, Infants and Children (WIC) vouchers. A monthly supply can cost up to 6 percent of a full-time minimum wage worker's salary. So local organizations and officials are banding together to collect diapers for those who otherwise couldn't afford them. Rapid City Mayor Steve Allender proclaimed Sept. 25 to Oct. 1 as Diaper Need Awareness Week in Rapid City, according to the release, to encourage citizens to donate diapers. The city's proclamation references national surveys that say one in three mothers experiences "diaper need" at some point, and that 48 percent of families delay changing a diaper to extend their supply. Out of the many thousands of homeless and low-income people in Los Angeles, a significant amount are children. The everyday battle of constantly worrying about where the next meal will come from or where to lay their head at night can be difficult for a young child. Out of the many burdens these families and children face daily, it is helpful to have a safe, educational place to go to not only escape life’s sometimes difficult journey, but enrich the minds of these children. The Crete Academy, a nonprofit elementary charter school, was created just for that reason. Founded by Hattie and Brett Mitchell, the Crete Academy delivers educational services to impoverished and homeless students from transitional kindergarten (4 years old) through the sixth grade. Volunteers with the Senior Companion Program recognized for the service to seniors with a special luncheon. The Senior Companion Program has helped thousands of senior citizens to stay living independently. Volunteers become friends with seniors in need and help them with light errands and companionship. Today the organization recognized 70 volunteers for their service. "They continually astound me with their compassion and their caring," said Eileen Pierson, Director, Senior Companion Program. City Year Los Angeles will celebrate its 11th Annual Opening Day swearing-in ceremony with the announcement of two unique programs designed to develop civic-minded leaders of tomorrow. The Teaching Intern Program, launched in partnership with the Los Angeles Unified School District, is a teacher credentialing program that would place dedicated teachers in L.A.’s highest need schools; the Leadership Fellows program, developed in collaboration with the USC Marshall School of Business, is a non-profit leadership certification program that prepares AmeriCorps members to take the principles of business and create lasting social change. A grant from the Polk County Community Foundation helped bring a much-needed extra set of hands to Polk Central Elementary during the 2016-17 school year. Donna Brice of AmeriCorps Project Mars spent the school year working with students and faculty at Polk Central, helping out in a number of ways around campus. Brice helped support mentoring, academic instruction and aided with providing resources for student success. She assisted in the early childhood classroom with literacy and math skills and also joined with school staff to support and expand programs for peer mentoring. One of her peer initiatives included assistance in organizing the Lunch Buddies program in which students from different grade levels met together weekly to work on social skills. In June, law student Amber Thomas returned to her hometown of Benton Harbor as the commencement speaker for her alma mater, Benton Harbor High School and Dream Academy. The oldest of nine and the first member of her family to go to college, she got an early lift in her career path in a Rotary Club mentoring program, mentored by a county sheriff, judges, lawyers, a dispatcher, and a forensic scientist during her junior and senior years of high school. Now a 3L student at Michigan State University College of Law, Thomas was honored earlier this year with an Outstanding Women Law Students Award from the Women Lawyers Association of Michigan Foundation (WLAMF). CNCS Chief of External Affairs Carl Higbie details long rebuilding process in devastated areas in Texas, Florida and Puerto Rico. A group of almost 50 volunteers gathered at the Y to remember the fallen and contribute something positive by beautifying outdoor public spaces. The project were made possible by a $1,000 grant from the Corporation for National and Community Service, a federal agency that partners with local organizations like the American Legion to promote community service. The grant was supplemented by a generous donation of supplies from Lowe’s of Northbrook.